Siberian Husky potty training is not much different from potty training other breeds. However, one thing to note is that Huskies can be quite stubborn and do not respond very well to yelling or shouting. You will want to be clear and use positive reinforcement consistently when potty training your Husky. Potty training can be a frustrating task, especially when you discover an accident on the carpet, but never lose your cool in front of your pup as it will never help and may even set back the training. Don’t give up and with enough effort and consistency, your Husky will be potty trained successfully. There are a number of different methods of potty training out there. It is crucial that you pick one that best suits your lifestyle/home and stick with it. If you get distracted and attempt to try out more than one type of method during the process, it will only confuse your Husky and prolong the training. If you have access to a yard and are not away from home for most of the day, crate training is the most effective method for you. If you live in an apartment, do not have access to a yard, or are away from home for several hours a day, you may wish to use paper training as an aide to potty training. Crate training is probably the most effective method of potty training a Husky. Not only is it easy and effective, it is safe and has the added benefit that your Husky will become accustomed to staying within a crate. When done properly, your Husky should be potty trained within 2 weeks, usually within less than a week, using crate training. The main things you will want to keep in mind before using this method is that you must be very consistent and keep a strict schedule. If you leave your puppy in his crate for too long and he has an accident inside the crate, that can set back the training by a lot. Crate training is based on the fact that dogs will not soil their “dens.” Because of this fact, your Husky will try his best not to eliminate inside his crate, given that it’s the appropriate size (just large enough for him to stand up and turn around). When you are crate training your Husky, you must be vigilant about taking him outside at regular intervals during the whole day, and even night! For example, if your Husky is 8 weeks old, you will want to take him outside at about every hour. In addition, keep in mind that after having a meal, your puppy will need to eliminate within about 20-30 minutes, so plan your schedule accordingly. When your puppy does eliminate outside, praise him lavishly and reward him with a treat. It may also be helpful to use a verbal command, such as “get busy” or “go potty” every time he eliminates, so that he will associate that phrase with going potty in the future. 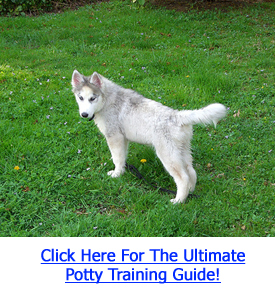 Click Here To Start Potty Training Your Husky NOW With Proven Methods! Paper training basically consists of placing “paper” in a designated area of the house where you will train your puppy to go potty at. Of course, since Siberian Huskies are a reasonably large breed of dog, most owners will not want their Husky to go potty inside the house indefinitely! Paper training should be used as an aide to potty training, not as a permanent solution. Paper training is very similar to potty training your puppy to eliminate in your yard. The only difference is that you are training him to eliminate inside the house in a designated area. It is very easy to paper train a puppy. Watch for signs that he needs to go – sniffing, circling, or squatting behaviour – and then quickly place him on top of the paper. Praise him for eliminating on the paper every time. After several repetitions, he should have learned to eliminate on the papers by himself. Eventually, you will want to train your Husky to eliminate outside. Some owners have had success with gradually moving the “paper” closer and closer to the door. Combining paper training with crate training is another helpful method of teaching your Husky to go potty outdoors. The advantage to paper training is that he will not have to hold his bladder or bowels for long periods of time if you are away from home for several hours a day. During the time that you are at home, you can use crate training to train your puppy to eliminate outdoors. It will take longer for him to learn that he is supposed to go to the bathroom outside if you use paper training. However, using crate training for 100% of the time does not fit in with many people’s schedules. Hence, paper training can be a very helpful tool. The importance of having a schedule and being consistent while potty training cannot be emphasized enough. Set a strict schedule for when you should take your puppy outside to go potty – for example, every hour on the dot. Also be sure to reward and praise him enthusiastically each time he does the right thing – potty training is one thing where you will not want to under-deliver praise with. With a positive attitude and consistency, you can most certainly potty train your Husky successfully.